Awarding ideas | How to's and great ideas to make awards do more for you and your team. How to's and great ideas to make awards do more for you and your team. 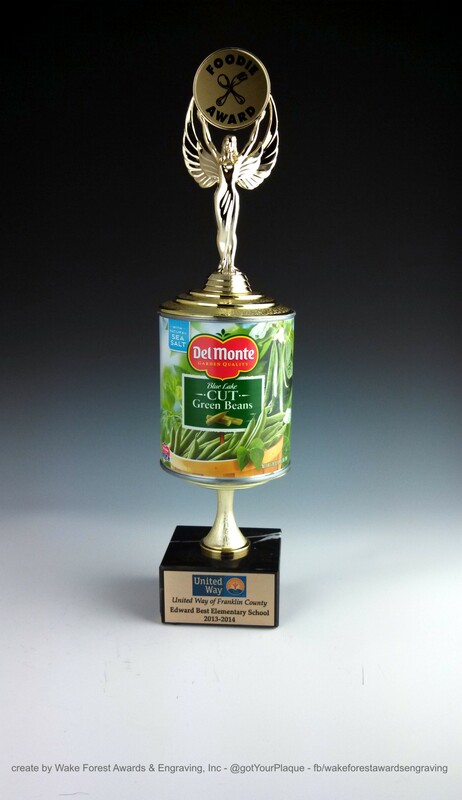 Award created for top schools for a food drive for @UnitedWay of Franklin County NC using a @DelMonte can. Hey @DelMonte let us know if you are interested in helping out “Feeding Franklin”, I know they would be very appreciative of anything you could do. Live United. I know, I should be strung up by my toes for even suggesting that you not buy a nice new shiny award from a business like mine. I can hear my friendly and not so friendly competitors saying….STOP! But sometimes an award can be something decidedly “un-awardish”. I was thinking the other day, if you are a manager of a organization where your team needs to keep up with the work flow and not get behind then I have an idea for you. This could be a factory, records processing, a restaurant or any group that needs to keep with the work flow. You could give a plumber’s wrench to the team member that had the highest productivity. Why a plumber’s wrench you ask? Great question! Well obviously they have done the most to prevent or fix well…..back ups!! Hey, I could have said a plunger, but I thought a wrench would go over better with most crowds. But you know your folks better than I do. You could call it the “Plumber’s Award” and give it out at a weekly or monthly staff meeting. It’s nothing special just a cheap wrench from a big box store, but to the team it represents something far more powerful. If you give out the same wrench each week to the next person who earned it; a strange thing will happen. Those who have not Earned the wrench will want the wrench, and those how have Earned It will want to keep it. It adds much need fun and levity to the work place and improves productivity without stepping foot into an trophy shop or continuing the beatings. Also the number of puns that will be flung about (there’s one now) will keep people coming back for more. This will feed on itself faster than bacteria in an all you can eat buffet. Now if you really want to include an awards company to help out (there is a collective sigh of relief from the awards businesses across the world), you could include a perpetual plaque that is updated each time you give out this Plumber’s Award to retain the history of the winners. And at the end of the year, you could even mount the very wrench you passed out all year on a plaque and present it to the team member that did the most to prevent/fix back logs. We can even paint it gold…imagine the fun you could have with that. BTW – if you go the plunger route, speaking on behalf of all awards businesses world wide, please make it a new unused one. Plumber’s Award – goes to the team member that did the most to improve productivity by preventing or fixing…back ups. This entry was posted in UnAwardish Ideas and tagged awards, management, motivation, motivational, plaques, plumbers wrench, productivity, productivity awards, trophies, trophy shops, work flow on March 25, 2014 by Darren Smith.